Texas A&M University Emergency Medical Services (EMS) responds to over 900 calls for emergency requests every year. Not only does this make our EMS so unique, TAMU EMS employs over 100 staff members, ranging from paramedics to emergency medical technicians (EMT’s). 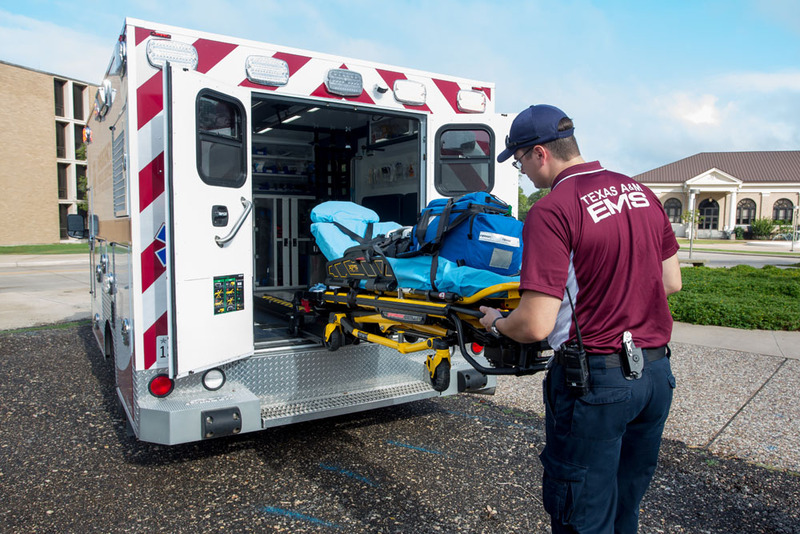 Furthermore, TAMU EMS employs many current and former Texas A&M University students, and was the very first SEC team to have a dedicated ambulance service on campus. Whoop to TAMU EMS! TAMU EMS not only responds to calls for emergency requests, they also provide medical event coverage for various events. If a student organization, department, or company need medical coverage, TAMU EMS can be requested to staff any events depending on availability. Ambulance scheduling: regardless the size of an event, TAMU EMS can provide MICU ambulance coverage. Medical Bike Teams: these teams are composed of EMS staff and provide Advanced Life Support medical capabilities. You can often see these teams at TAMU sporting events providing basic emergency medical care to students and visitors on campus. Special Event EMT-Basics: this service is provided for individuals or groups that need First Aid Units at an event. Depending on the event location and availability, a medical ATV can also be offered. CPR Education: TAMU EMS regularly provides CPR training at the Student Recreation Center, but EMS is also able to provide training for groups of individuals elsewhere. CPR education inquiries should be directed to ems.tamu.edu/contact-us. If you are in need of emergency medical event coverage, please submit a request here: ems.tamu.edu/event-request. TAMECT is a student run organization that provides emergency medicine on campus. TAMECT continuously works with TAMU EMS to provide additional first responders at first-aid stations for large events. Such events include: TAMU athletic events, Corps of Cadets events, and more. Not only does TAMECT partner with TAMU EMS, the Care Team provides training opportunities for its members, including American Heart Association certifications in first aid and CPR, and more. TAMECT is an integral part of TAMU EMS and continually strives to provide exceptional emergency medical care alongside TAMU EMS. What does it mean to have TAMU EMS on campus? TAMU EMS is able to respond to emergency calls on campus in a very efficient and effective manner. TAMU EMS is available 24 hours a day, seven days a week. TAMU EMS is currently housed in the A.P. Beutel Health Center, which provides convenience access to any calls for emergency requests on campus. TAMU EMS works very closely with various community and University stakeholders to provide the best possible care to students, faculty, staff, and visitors on campus. TAMU EMS is always ready to respond to medical emergencies, and takes great provide in the exceptional services they provide. To learn more about TAMU EMS, visit ems.tamu.edu. To learn more about TAMECT, visit tamect.tamu.edu.